Die Martis, 8° Maii 1832. Scot v. Stewart et al. D. of Roxburghe et al. v. Kerr. Five Oaks Road Bill, Petition in favor of, referred to the Com ee. Crowder v. Watson et al Appellant's Petition to restore Appeal, referred to Appeal Com ee. Hartlepool Docks & Railway Bill. Norwich & Fakenham Road Bill. Newcastle & Drayton Road Bill. Ecclesiastical Corporation Lands Bill presented. Slavery, Petitions from Hemel Hempstead & St. Albans for Abolition of. Mills & Factories, Petition from St. Albans for regulating Hours of Labour in. Agricultural Poor Bill, Petitions from Skipsea & Beeford in favor of. Reform (England) Bill, Petitions from Lewes & Dumfries in favor of. Education, (Ireland,) Petitions from Dumfries & Derby in favor of proposed Plan. Tithes, (Ireland,) Petition from Seapatrick respecting, & in favor of Reform (England) Bill. Tithes & Church Rates, (Ireland,) Petitions from Kilcouly & Crossboyne, &c. for Abolition of. Tithes, (Ireland,) Petition from Mullyfarnham, &c. for Abolition of, & Repeal of Vestry Laws. Tithes, (Ireland,) Petition from Clonnoulty & Rossmore for Abolition of. 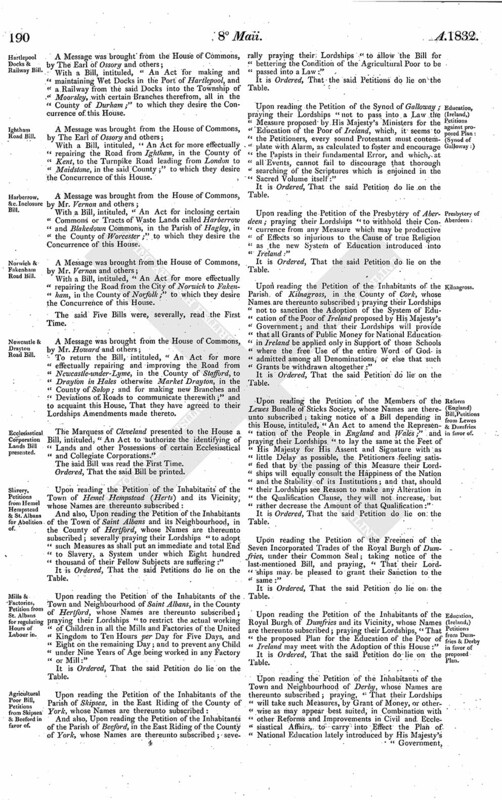 Reform of Parliament, Petition from Clonnoulty & Rossmore in favor of. Indemnity Bill, Petition from Newtownsmith against. Cruelty to Animals, Petition from Saffron Walden for Prevention of. Reform (England) Bill, Petition from Mayor, &c. of Norwich against. 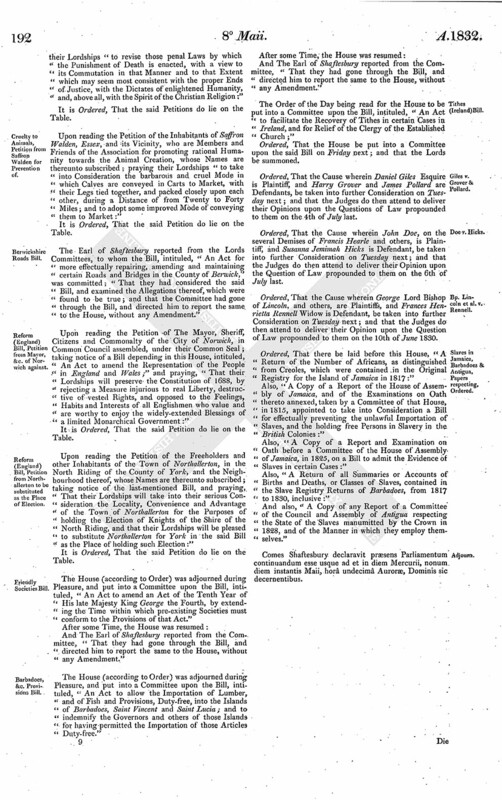 Reform (England) Bill, Petition from Northallerton to be substituted as the Place of Election. Giles v. Grover & Pollard. Bp. Lincoln et al. v. Rennell. Slaves in Jamaica, Barbadoes & Antigua, Papers respecting, Ordered. The joint and several Answer of James Stewart of Brugh, Esquire, Marion Stewart, and William Stewart, Merchant in Leith, to the Petition and Appeal of Alexander Scot Esquire, Writer to the Signet, Complainant, was this Day brought in. Hodie 3a vice lecta est Billa, intituled, "An Act for better maintaining the Road leading from Robeston Wathan to Saint Clears, and other Roads, in the Counties of Pembroke and Carmarthen; and for making several Branches from such Roads." The House being moved, "That a Day may be appointed for hearing the Cause wherein James Henry Robert Duke of Roxburghe, and others, are Appellants, and Robert Kerr Esquire is Respondent:"
Upon reading the Petition of George Obrien Earl of Egremont, and of the Creditors on the Tolls of the Turnpike Road from Five Oaks, in the Parish of Billingshurst, in the County of Sussex, to join the Horsham and Guilford Turnpike Road on Broadbridge Heath, in the said County, whose Names are thereunto subscribed; taking notice of a Bill depending in this House, intituled, "An Act for more effectually repairing and maintaining the Turnpike Road from or near a Place called The Five Oaks, in the Parish of Billingshurst, to join the Horsham and Guildford Turnpike Road on Broadbridge Heath, in the County of Sussex;" and praying their Lordships, "That the same may be passed into a Law without Alteration:"
The House being informed, "That Mr. Berthon, from the Trinity House, attended;"
"An Account of the Receipt and Appropriation of the Pilots Fund of the Corporation of Trinity House of Deptford Strond, distinguishing the several Sources of Income and Heads of Expenditure, in the Year ending 31 January 1831." Upon reading the Petition of Mrs. Elizabeth Rebecca Crowder or Turnley, Appellant in a Cause depending in this House, to which James Watson, and others, are Respondents; praying, "That their Lordships will be pleased to order that this Appeal may be restored to the Position wherein it stood at the Time of its Dismissal, the Agent for the Respondents having signed the said Petition as consenting thereto:"
Ordered, That John Hughes, John Ebdell, John Ferguson, Edward Holton, William Heningham, Joseph Voy and John Bartholomew do attend this House To-morrow, to be sworn, in order to their being examined as Witnesses before the Committee to whom the Bill, intituled, "An Act for amending an Act passed in the Ninth Year of the Reign of His late Majesty King George the Fourth, intituled, "An Act for rebuilding, or for improving, regulating and maintaining the Town Quay of Gravesend, in the County of Kent, and the Landing Place belonging thereto;" and for building a Pier of Jetty adjoining thereto; and for other Purposes connected therewith," stands committed. With a Bill, intituled, "An Act for more effectually repairing the Road leading from Shankill, in the County of Kilkenny, to the City of Waterford;" to which they desire the Concurrence of this House. With a Bill, intituled, "An Act for making and maintaining Wet Docks in the Port of Hartlepool, and a Railway from the said Docks into the Township of Moorsley, with certain Branches therefrom, all in the County of Durham;" to which they desire the Concurrence of this House. With a Bill, intituled, "An Act for more effectually repairing the Road from Ightham, in the County of Kent, to the Turnpike Road leading from London to Maidstone, in the said County;" to which they desire the Concurrence of this House. With a Bill, intituled, "An Act for inclosing certain Commons or Tracts of Waste Lands called Harberrow and Blakedown Commons, in the Parish of Hagley, in the County of Worcester;" to which they desire the Concurrence of this House. With a Bill, intituled, "An Act for more effectually repairing the Road from the City of Norwich to Fakenham, in the County of Norfolk;" to which they desire the Concurrence of this House. To return the Bill, intituled, "An Act for more effectually repairing and improving the Road from Newcastle-under-Lyme, in the County of Stafford, to Drayton in Hales otherwise Market Drayton, in the County of Salop; and for making new Branches and Deviations of Roads to communicate therewith;" and to acquaint this House, That they have agreed to their Lordships Amendments made thereto. The Marquess of Cleveland presented to the House a Bill, intituled, "An Act to authorize the identifying of Lands and other Possessions of certain Ecclesiastical and Collegiate Corporations." And also, Upon reading the Petition of the Inhabitants of the Town of Saint Albans and its Neighbourhood, in the County of Hertford, whose Names are thereunto subscribed; severally praying their Lordships "to adopt such Measures as shall put an immediate and total End to Slavery, a System under which Eight hundred thousand of their Fellow Subjects are suffering:"
Upon reading the Petition of the Inhabitants of the Town and Neighbourhood of Saint Albans, in the County of Hertford, whose Names are thereunto subscribed; praying their Lordships "to restrict the actual working of Children in all the Mills and Factories of the United Kingdom to Ten Hours per Day for Five Days, and Eight on the remaining Day; and to prevent any Child under Nine Years of Age being worked in any Factory or Mill:"
And also, Upon reading the Petition of the Inhabitants of the Parish of Beeford, in the East Riding of the County of York, whose Names are thereunto subscribed; severally praying their Lordships "to allow the Bill for bettering the Condition of the Agricultural Poor to be passed into a Law:"
Upon reading the Petition of the Synod of Galloway; praying their Lordships "not to pass into a Law the Measure proposed by His Majesty's Ministers for the Education of the Poor of Ireland, which, it seems to the Petitioners, every sound Protestant must contemplate with Alarm, as calculated to foster and encourage the Papists in their fundamental Error, and which, at all Events, cannot fail to discourage that thorough searching of the Scriptures which is enjoined in the Sacred Volume itself:"
Upon reading the Petition of the Presbytery of Aberdeen; praying their Lordships "to withhold their Concurrence from any Measure which may be productive of Effects so injurious to the Cause of true Religion as the new System of Education introduced into Ireland:"
Upon reading the Petition of the Inhabitants of the Parish of Kilnagross, in the County of Cork, whose Names are thereunto subscribed; praying their Lordships not to sanction the Adoption of the System of Education of the Poor of Ireland proposed by His Majesty's Government; and that their Lordships will provide that all Grants of Public Money for National Education in Ireland be applied only in Support of those Schools where the free Use of the entire Word of God is admitted among all Denominations, or else that such Grants be withdrawn altogether:"
Upon reading the Petition of the Members of the Lewes Bundle of Sticks Society, whose Names are thereunto subscribed; taking notice of a Bill depending in this House, intituled, "An Act to amend the Representation of the People in England and Wales;" and praying their Lordships "to lay the same at the Feet of His Majesty for His Assent and Signature with as little Delay as possible, the Petitioners feeling satisfied that by the passing of this Measure their Lordships will equally consult the Happiness of the Nation and the Stability of its Institutions; and that, should their Lordships see Reason to make any Alteration in the Qualification Clause, they will not increase, but rather decrease the Amount of that Qualification:"
Upon reading the Petition of the Freemen of the Seven Incorporated Trades of the Royal Burgh of Dumfries, under their Common Seal; taking notice of the last-mentioned Bill, and praying, "That their Lordships may be pleased to grant their Sanction to the same:"
Upon reading the Petition of the Inhabitants of the Royal Burgh of Dumfries and its Vicinity, whose Names are thereunto subscribed; praying their Lordships, "That the proposed Plan for the Education of the Poor of Ireland may meet with the Adoption of this House:"
Upon reading the Petition of the Inhabitants of the Town and Neighbourhood of Derby, whose Names are thereunto subscribed; praying, "That their Lordships will take such Measures, by Grant of Money, or otherwise as may appear best suited, in Combination with other Reforms and Improvements in Civil and Ecclesiastical Affairs, to carry into Effect the Plan of National Education lately introduced by His Majesty's Government, a Change which shall happily contrast with the Misery and Misrule unfortunately so conspicuous in the past History of Ireland:"
Upon reading the Petition of the Landholders of the Parish of Seapatrick, County of Devon, whose Names are thereunto subscribed; expressing their Satisfaction on finding that Government have declared that Tithes in Ireland are to be extinguished in future, and praying, "That their Lordships will pass the present Reform Bill as now brought to them by the Commons with as little Delay as possible, so as to secure the Peace, Comfort and Happiness of the People of Great Britain and Ireland:"
Upon reading the Petition of the Members of the Political Union of Waterford, whose Names are thereunto subscribed; praying their Lordships, "That not only the Laws relating to Tithes be for ever abolished, but that any Measure proposed for enforcing the Arrears of same may at once be rejected by the Legislature:"
Upon reading the Petition of the Inhabitants of the United Parishes of Clondalkin, Lucan and Palmerstown, Tithes Payers, Ireland, whose Names are thereunto subscribed; praying, "That their Lordships, by abolishing Tithes in Ireland, will afford them the Relief that they seek for, which the present distressed State of the Agriculture of that Country, and consequently of their labouring Poor, appears to the Petitioners so imperatively to require:"
Upon reading the Petition of the Landholders of the Parish of Lanesboro, in the County of Longford, Ireland, whose Names are thereunto subscribed; praying their Lordships "to totally abolish the Tithe System in that impoverished Country, Ireland, as the Petitioners are no longer able to endure such enormous Taxation:"
Upon reading the Petition of the Inhabitants of the Parish of Loughmore, in the County of Tipperary, Ireland, whose Names are thereunto subscribed; praying their Lordships "to abolish Tithes and Church Taxes, to give to Government the Management of the Church Lands in Trust for the Support of the Protestant Clergy and the Poor, and from the Rents thereof maintain the former as Ministers of Religion, as Men of Education, as Gentlemen, but no more as Princes; and that the Residue (for a Residue there ought to be) may be applied to the Service of the State:"
Upon reading the Petition of the Inhabitants of the Parish of Shrule, in the County of Longford, Ireland, whose Names are thereunto subscribed; praying their Lordships, "That for the Furtherance of Justice, the Benefit of Society, and the Glory of God, who is daily outraged by the cruel Practice of exacting Tithes in Ireland, they will abolish them for ever in that Country; apply the Church Lands for the Maintenance of the Poor, and other Exigencies of the State, leaving the Protestant Bishops and Parsons to live in a Christianlike Manner on the voluntary Oblations of those who may require or value their Services:"
Upon reading the Petition of the Tithe Payers of the Barony of Bargy and County of Wexford, whose Names are thereunto subscribed; praying their Lordships, "That the iniquitous Impost of Tithes may be totally abolished, and that all Church Property be taken into the Hands of Government, being amply sufficient to provide for the existing Clergy, besides leaving a Surplus to be applied to the Benefit of the entire People:"
And also, Upon reading the Petition of the Inhabitants of the Parish of Crossboyne, Kilvine, Annagh and Tagheen, whose Names are thereunto subscribed; severally praying, "That their Lordships will take immediate Measures for the total Abolition of Tithes and Church Rates in Ireland:"
Upon reading the Petition of the Inhabitants of the Parishes of Mullyfarnham, Leany and Lacken, in the County Westmeath, in Ireland, whose Names are thereunto subscribed; praying their Lordships "either to reserve the Settlement of the Tithe Question for the Consideration of a reformed Parliament, or to abolish for ever that unjust and oppressive Impost, not merely in Name but in reality; and that their Lordships will repeal the Vestry Laws altogether:"
Upon reading the Petition of the Inhabitants of the United Parishes of Clonnoully and Rossmore, County Tipperary, whose Names are thereunto subscribed; praying their Lordships, "as they value the Welfare and Tranquillity of that much neglected Country, Ireland, to effect a total and speedy Abolition of Tithes, that galling Nuisance, that oppressive Burthen and enormous Tax on Industry, which paralizes their Energies, and is the prolific Source of every Species of Discord and Strife:"
Upon reading the Petition of the Inhabitants of Clonnoulty and Rossmore, County Tipperary, Ireland, whose Names are thereunto subscribed; expressing their Gratification at the large and ample Measures of Parliamentary Reform intended by His Majesty's Ministers for England and Scotland; and praying their Lordships, "That that withering System of Policy so long pursued towards Ireland may be speedily terminated by a full and substantial Reform in their Representative System, that will effectually put an End to those glaring Corruptions for which it has been proverbial, and secure to Ireland that Weight and Influence in the Imperial Parliament she is so justly entitled to demand and possess:"
Upon reading the Petition of the Land Owners and Inhabitants of the Parish of Newtownsmith, Galway, whose Names are thereunto subscribed; praying their Lordships "to redress the unparalleled Expungements and Interpolations in the Indemnity Bill, so as to extend to the Petitioners the full Benefits of the great Measures of Reform and Religious Liberty; and that the Petitioners may be heard by Counsel at the Bar of this House against the singular Changes in said Bill:"
And also, Upon reading the Petition of the Inhabitants of Moate and its Vicinity, in the County Westmeath, whose Names are thereunto subscribed; severally praying their Lordships "to revise those penal Laws by which the Punishment of Death is enacted, with a view to its Commutation in that Manner and to that Extent which may seem most consistent with the proper Ends of Justice, with the Dictates of enlightened Humanity, and, above all, with the Spirit of the Christian Religion:"
Upon reading the Petition of the Inhabitants of Saffron Walden, Essex, and its Vicinity, who are Members and Friends of the Association for promoting rational Humanity towards the Animal Creation, whose Names are thereunto subscribed; praying their Lordships "to take into Consideration the barbarous and cruel Mode in which Calves are conveyed in Carts to Market, with their Legs tied together, and packed closely upon each other, during a Distance of from Twenty to Forty Miles; and to adopt some improved Mode of conveying them to Market:"
The Earl of Shaftesbury reported from the Lords Committees, to whom the Bill, intituled, "An Act for more effectually repairing, amending and maintaining certain Roads and Bridges in the County of Berwick," was committed; "That they had considered the said Bill, and examined the Allegations thereof, which were found to be true; and that the Committee had gone through the Bill, and directed him to report the same to the House, without any Amendment." 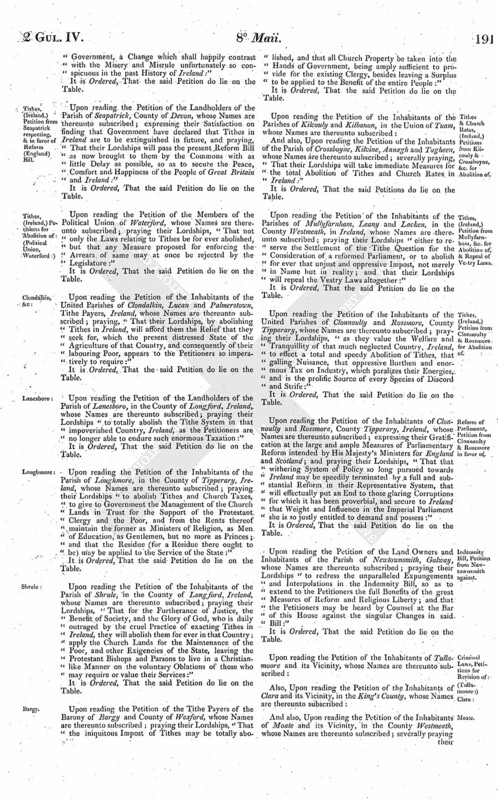 Upon reading the Petition of The Mayor, Sheriff, Citizens and Commonalty of the City of Norwich, in Common Council assembled, under their Common Seal; taking notice of a Bill depending in this House, intituled, "An Act to amend the Representation of the People in England and Wales;" and praying, "That their Lordships will preserve the Constitution of 1688, by rejecting a Measure injurious to real Liberty, destructive of vested Rights, and opposed to the Feelings, Habits and Interests of all Englishmen who value and are worthy to enjoy the widely-extended Blessings of a limited Monarchical Government:"
Upon reading the Petition of the Freeholders and other Inhabitants of the Town of Northallerton, in the North Riding of the County of York, and the Neighbourhood thereof, whose Names are thereunto subscribed; taking notice of the last-mentioned Bill, and praying, "That their Lordships will take into their serious Consideration the Locality, Convenience and Advantage of the Town of Northallerton for the Purposes of holding the Election of Knights of the Shire of the North Riding, and that their Lordships will be pleased to substitute Northallerton for York in the said Bill as the Place of holding such Election:"
The House (according to Order) was adjourned during Pleasure, and put into a Committee upon the Bill, intituled, "An Act to amend an Act of the Tenth Year of His late Majesty King George the Fourth, by extending the Time within which pre-existing Societies must conform to the Provisions of that Act." The House (according to Order) was adjourned during Pleasure, and put into a Committee upon the Bill, intituled, "An Act to allow the Importation of Lumber, and of Fish and Provisions, Duty-free, into the Islands of Barbadoes, Saint Vincent and Saint Lucia; and to indemnify the Governors and others of those Islands for having permitted the Importation of those Articles Duty-free." 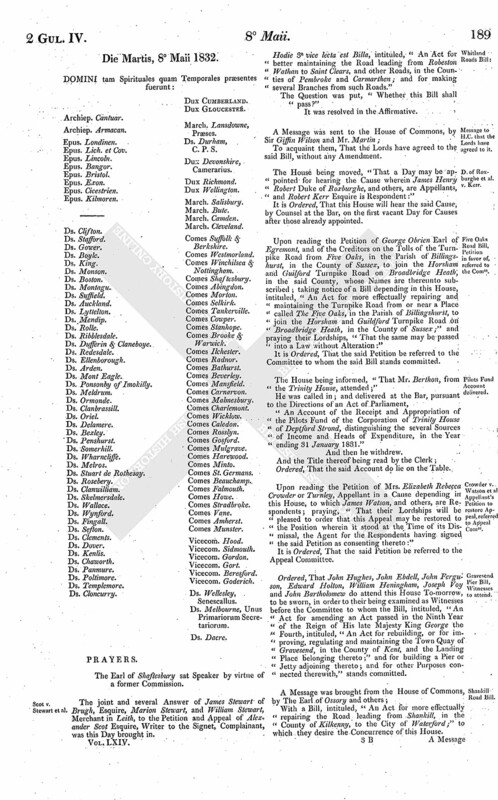 The Order of the Day being read for the House to be put into a Committee upon the Bill, intituled, "An Act to facilitate the Recovery of Tithes in certain Cases in Ireland, and for Relief of the Clergy of the Established Church;"
Ordered, That the Cause wherein Daniel Giles Esquire is Plaintiff, and Harry Grover and James Pollard are Defendants, be taken into further Consideration on Tuesday next; and that the Judges do then attend to deliver their Opinions upon the Questions of Law propounded to them on the 4th of July last. Ordered, That the Cause wherein John Doe, on the several Demises of Francis Hearle and others, is Plaintiff, and Susanna Jemimah Hicks is Defendant, be taken into further Consideration on Tuesday next; and that the Judges do then attend to deliver their Opinion upon the Question of Law propounded to them on the 6th of July last. Ordered, That the Cause wherein George Lord Bishop of Lincoln, and others, are Plaintiffs, and Frances Henrietta Rennell Widow is Defendant, be taken into further Consideration on Tuesday next; and that the Judges do then attend to deliver their Opinion upon the Question of Law propounded to them on the 10th of June 1830. Ordered, That there be laid before this House, "A Return of the Number of Africans, as distinguished from Creoles, which were contained in the Original Registry for the Island of Jamaica in 1817:"
Also, " A Copy of a Report of the House of Assembly of Jamaica, and of the Examinations on Oath thereto annexed, taken by a Committee of that House, in 1815, appointed to take into Consideration a Bill for effectually preventing the unlawful Importation of Slaves, and the holding free Persons in Slavery in the British Colonies:"
Also, "A Copy of a Report and Examination on Oath before a Committee of the House of Assembly of Jamaica, in 1825, on a Bill to admit the Evidence of Slaves in certain Cases:"
Also, "A Return of all Summaries or Accounts of Births and Deaths, or Classes of Slaves, contained in the Slave Registry Returns of Barbadoes, from 1817 to 1830, inclusive:"
And also, "A Copy of any Report of a Committee of the Council and Assembly of Antigua respecting the State of the Slaves manumitted by the Crown in 1828, and of the Manner in which they employ themselves." Comes Shaftesbury declaravit præsens Parliamentum continuandum esse usque ad et in diem Mercurii, nonum diem instantis Maii, horâ undecimâ Auroræ, Dominis sic decernentibus.